A smarter way of doing peptide cleavage. With the advantages of precision heated reactions, you can get better peptide purity. Now you can cleave up to 12 peptides, simultaneously, in 30 minutes or less, with more reliability than any other method. This is high throughput cleavage. Fast - Cleave as quickly as you purify. You can now get faster analytical results. Microcleavage in as little as 2 minutes provides mass spectrometry level confidence that expensive amino acids and scale up syntheses are coupled completely. 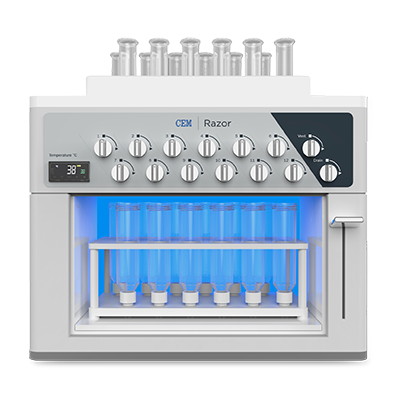 Full cleavage after peptide synthesis in 30 minutes or less accelerates the purification work flow of your laboratory. Access purified peptides faster than any other method. Pure - Achieve better purity peptides from a more complete cleavage. Heat accelerates removal of all protecting groups, even tough ones. With the Razor, there’s no need to wonder if all the Pbf is off of your peptide...you know it is. The increased temperature promotes molecular motion, giving cleavage and scavenging reagents access to hydrophobic regions and sterically hindered portions of long peptides. 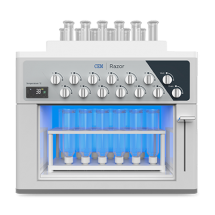 This allows for an optimized workflow after automated peptide synthesis particularly when using a rapid automated microwave peptide synthesizer. Reliable - Protect your automated peptide synthesizer. Stay running around the clock despite harsh cleavage reagents and scavengers that can cause wear on your automated peptide synthesizer. The simple design of the Razor does not have a complicated valve block system, requiring expensive, technician only maintenance. Disposable vessels make clean up easy and ensure integrity of peptide purity.